In July of 1948 detailed plans were revealed for the new laboratory school to be built at the Teachers College. 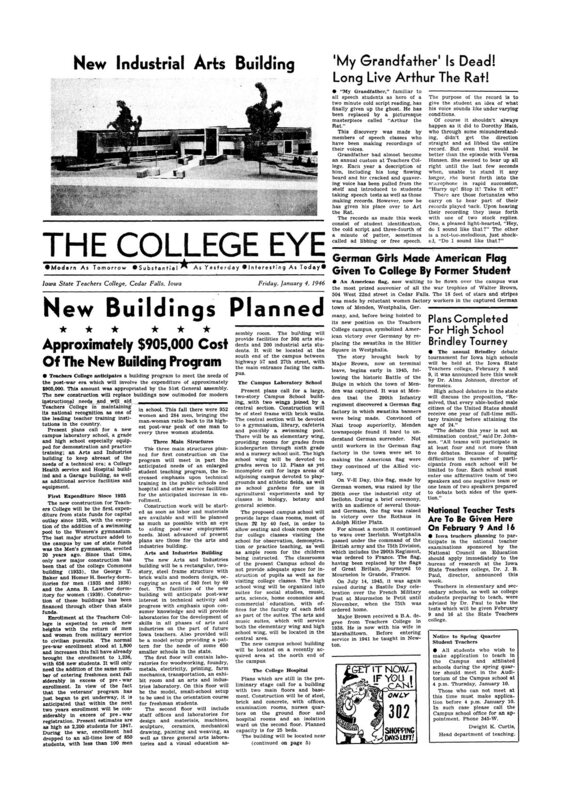 In this article from "The College Eye" on July 23rd we learned that "The construction would be steel frame with brick and stone trim and a green stone panel between floors." President Malcolm Price is quoted as saying "A campus school at the Teachers college is equivalent to the hospital of a medical school. The teaching laboratory attempts to make provisions for all types of experiences that teachers might have in Iowa schools." In addition to the new building, plans were made for the surrounding grounds, including playgrounds for the elementary grades, fields for high school sports, practice tennis courts, practice golf greens, and football and baseball fields with permanent bleachers. The article also stated that plans called for room for botanical gardens. Monday Memory - "New Campus School Planning Underway"
Today's Monday Memory takes us back to the timeline for the building of Price Laboratory School at Campus and 19th Streets. 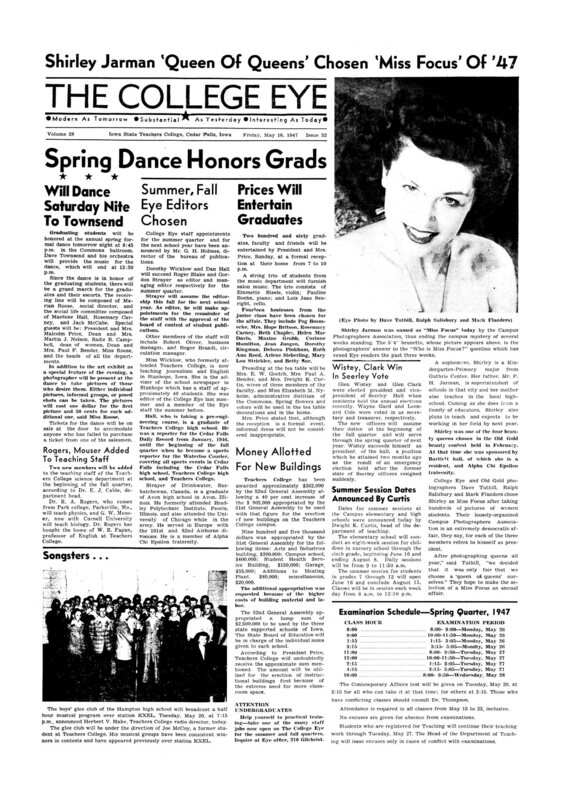 There would be a further eight month delay, until January of 1948, before President Price could announce that the planning phase of the new Laboratory school at Teachers College was underway. The announcement detailed plans for the new building's layout including "...larger classrooms, most of them 22 by 40 feet, in order to allow seating and cloak room space for college classes visiting the school for observation, demonstration, practice teaching, as well as ample room for the children being instructed." The path to a new laboratory school building on the north end of campus was not a quick and easy one. While $905,000 for new buildings was approved in late 1945, early 1946, it would be almost another full year, until January of 1947, before the next steps in the process would begin. This delay caused a significant increase in the projected cost of the building projects President Price and the college had planned. President Price returned to the Iowa Legislature to ask for both in increase in the college's budget and an additional $2,066,500 for building projects that included the laboratory school. 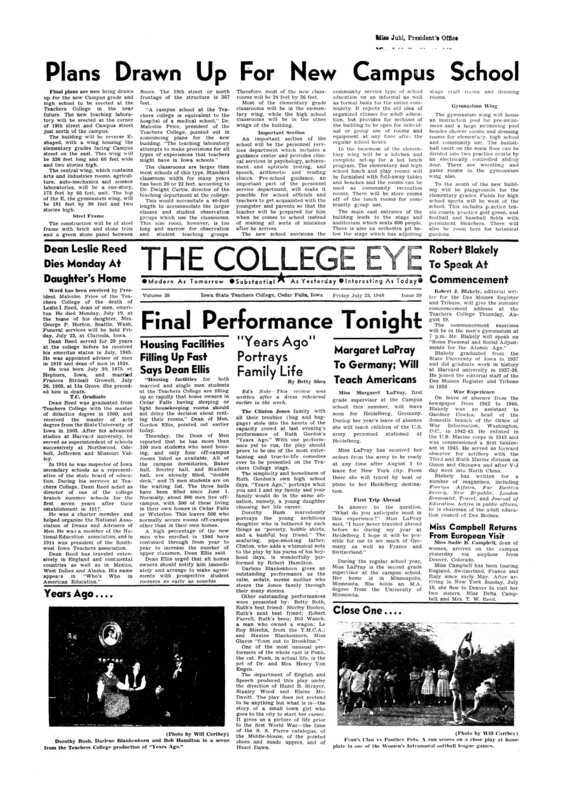 As you can read in this January 10, 1947 issue of "The College Eye", the projects were on hold until the legislature made a decision. (Click the photo above to see a larger version. Of other historical note may be the news that a decision had been made for use of the current laboratory school building once a new campus school was constructed. It was announced that Sabin Hall would be used completely by the music department. In 1945 the state Teachers College proposed three new buildings to meet the needs of the post-war era. The first expenditure from state funds for capital improvements in almost 20 years. Among the proposed construction was a new laboratory school to be built on the north end of campus. Initial plans called for a two-story Campus School building, with two wings joined by a central section. With larger classrooms to allow space for both campus school and college students, the early plans also included school gardens for use in agricultural experiments and by classes in biology, botany and general science.